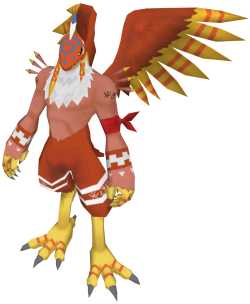 Garudamon is a Bird Digimon whose name and design are derived from the mythological Garuda. It has gigantic talons and wings that let it dance freely through the sky. Garudamon honors justice and order, and is a guardian deity of the land and wind that loves nature. Its intelligence and combat ability is highest among Bird Digimon, and it is admired due to it being said that only chosen Digimon can digivolve to it. It is thought that if the order of the Digital World is disturbed, it will suddenly appear out of nowhere, and quell the source of the unrest. Also, it is matchless friends with the hero Leomon, who possesses the same will. The DigiCode on its shoulders read "Digital Monster" (デジタルモンスター Dejitaru Monsutā). The raid has about 4 755 000 HP. This raid has an AoE skill that deals 6,000 of damage until its 80% HP. It uses a small circle to target a random player in the party. The skill animation is faster than Birdamon's, but it is still possible to run out of it. After 85% HP, the raid uses its second skill. It uses a big circle to target a random player in party. It is very fast, but still possible to run out of it. After the 80% HP, every 30 seconds, the raid will use its first skill, but this time, it will intercalate the small circle with the big circle. It will keep doing this until its death. The second skill (big circle) deals 12,500 of damage and gives you a debuff called "2nd-Degree Burn Debuff" in case you don't run out of it. No healer is required here too. One tanker and three hitters is required. The tanker must deal normal and skill damage to the raid, while the hitters will keep a distance and keep using only skills. Tanker must be very focused and careful aboiut the second skill (the big circle), and he has to stop hitting fast and run out of it. The raid will target a random player in the party every 30 seconds and the target player must stop hitting/using skills and run as fast as he/she can out of the circle. There is a delay of 5 seconds from the small circle to the big circle. Sometimes the raid summons the big circle first and then the small one. Note: It has been said among the players that this raid has a 7 minutes limit to be killed. If you don't kill it within the time limit, it will K.O. everyone hitting it. That's why a healer is not recommended in this raid. It's possible to avoid its skills and it's totaly easy to get the point after aquiring some experience. This page was last modified on 28 February 2019, at 07:57.